Republicans got the EAS cuts they were looking for in last week's agreement  but with a major caveat. Subsidies to Ely, Jackson and 11 other communities are set to end, but Transportation Secretary Ray LaHood has the authority to continue them if he decides it's necessary. Flights out of Morgantown, W.Va., were among those targeted by other Republicans. A $1 million subsidy amounted to about $52 for each of Morgantown's more than 10,000 passengers last year. McKinley describes himself "as a small government, free-market focused owner of a small business," but said airports that receive subsidies "serve as crucial engines of job creation for many small towns and rural areas." The EAS was created to ensure service on less profitable routes to remote communities when airlines were deregulated in 1978. A spokesman for the Department of Transportation did not respond to a request for comment about the program, which has grown in scope and cost. In 1999 the EAS served 89 communities  68 in the continental United States, one in Hawaii and 20 in Alaska. Today, it serves 45 in Alaska and 108 elsewhere, and over the last 10 years the budget quadrupled from $50 million to $200 million. The subsidies go to about a dozen airlines, but in 2010 almost one-third of the entire budget  $67.8 million -went to Great Lakes, which is based in Cheyenne, Wyo. The company did not respond to requests for comment. Ely is an extreme case. The House Transportation and Infrastructure Committee said it is one of just three cities in the program that have subsidies higher than $1,000 per passenger. 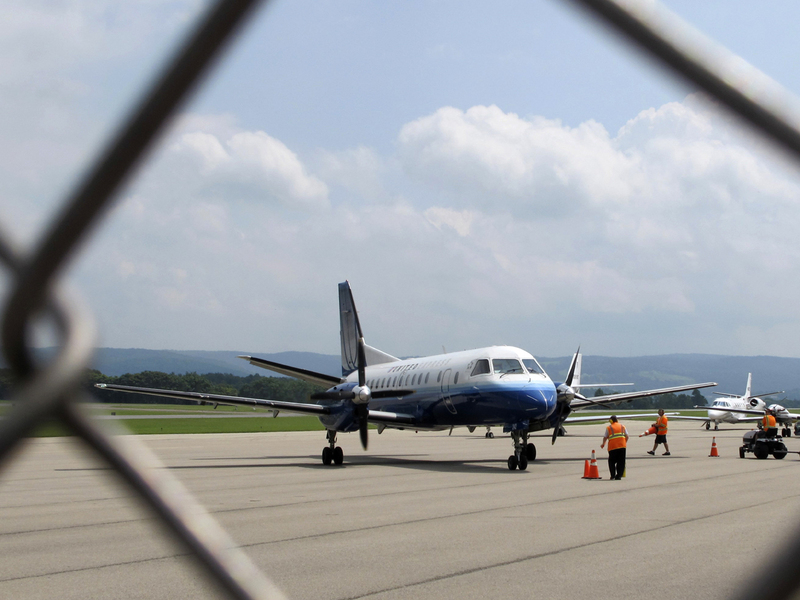 The others are Glendive, Mont., and Alamogordo, N.M.
Republicans targeted flights out of other cities such as Morgantown because they are relatively close to major airports. Mike Coster, Ely's airport manager, said the location between Las Vegas and Salt Lake City is the most remote airport in the continental United States. "We have no bus service here of any kind, no Greyhound or similar company," Coster said. "It's a small town." Severin Borenstein, a professor at the University of California, Berkeley who helped design the EAS program, said Congress originally intended for the program to end after 10 years. He said the subsidies are a "big problem" in places like Ely, which averages one or two passengers per flight. "I can see the argument for making some of them permanent, but the standards should be higher," Borenstein said. "The real story with this program nationwide is that nobody is watching it," said Smith, the Tennessee airport official. "If there is a problem with airports and airlines not carrying enough passengers and not doing what they said they would do, it's because once the contract is issued, it's like nobody ever asked a question about it again." Contracts are awarded through a competitive bid process, and generally last two years. The program has plenty of defenders who point out the cost is tiny compared with other transportation subsidies. According to a 2009 report from the Pew Charitable Trusts, highways got 76 percent of subsidies, mass transit 16 percent, aviation 6 percent and rail and maritime 3 percent. Pew estimates that transportation subsidies in 2008 came to about $45 billion, or $367 for every household in America. Faye Malarkey Black, a vice president for the Regional Airline Association, said she believes few federal programs accomplish as much for $200 million as EAS does. "They call it essential for a reason," she said. She said her industry group supports "common sense adjustments" for eligibility, but added that rural communities already struggle to attract and keep doctors and other professionals. "If you take away air service, who wants to live in those communities?" she said. Chadd Williams, a computer science professor at Pacific University, was flying back to Oregon from Morgantown after visiting family. He said a ticket to Morgantown typically costs him $75 to $100 more than one to Pittsburgh, about 75 miles away, but this time it cost about the same. "It's very convenient to have this place," Williams said. He said his family sometimes drives to Pittsburgh, to pick him up, but "that's a stress on them, and it's difficult to get up to Pittsburgh on time with all the road construction. So it would be terrible to have this go away." Flower shop owner Jim Coombs has been to the Morgantown airport seven times so far this summer to shuttle high school foreign exchange students to their host families. He'll be there seven more times to send them home. The nearest international airport is about an hour and a half's drive north in Pittsburgh, but traveling there means time wasted in traffic and in Interstate 79 construction zones, not to mention the cost of gas and pricey parking versus free. Coombs says the fact that the northern West Virginia city has its own airport is a selling point for people considering jobs there. "I think the people in Washington are the types that just think if it's not in a big area, it's not worth anything. They don't know what it's like here. They don't know what goes on here," Coombs said. In Alamogordo, officials said number-crunching doesn't explain the full value of access to air transportation. Saddled between southern New Mexico's Sacramento Mountains and the desolate Tularosa Valley, residents don't have any options for air travel other than twice daily, federally subsidized round-trip flights, said airport manager Parker Bradley. "It doesn't have to do with airports closing. It has to do with the availability or lack of availability of transportation. That can be a very important thing for a community," he said.